On Monday 17th February 2014, contractors working for Derbyshire County Council will be commencing work to re-surface the canal towpath/TPT between Wheeldon Mill Lock and Bilby Lane, with additional works to create a better ramp at Station Road, Brimington. The towpath itself will be officially closed for a period of up to six weeks. During this period, please follow the alternative route adjacent to the canal, as advertised in the official footpath closure notices posted on site. 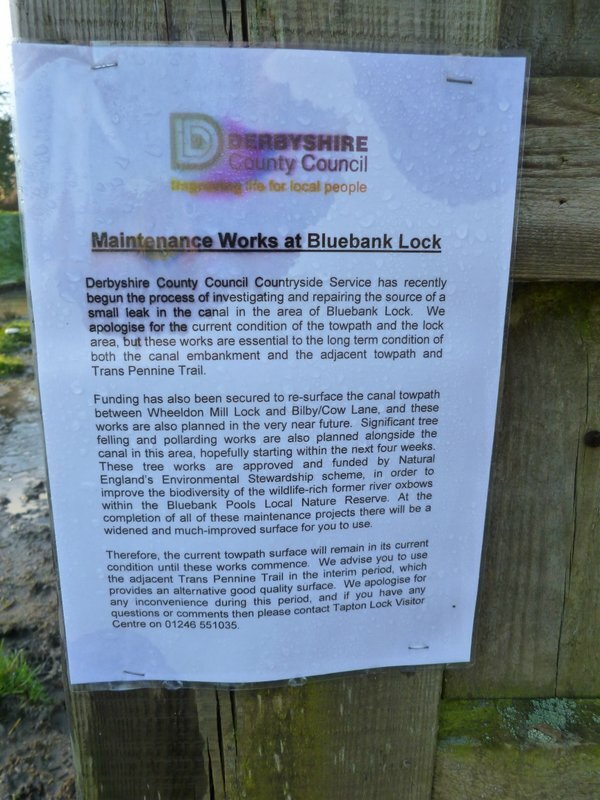 On Monday 17th and Tuesday 18th February 2014, contractors working for Derbyshire County Council will be replacing the old lock gates at Dixon’s Lock. 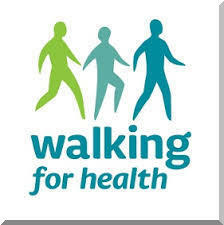 Our walks take us mainly into the countryside, but we probably do more urban walking as part of daily life. In 2026 – according to the Countryside & Rights of Way Act (2000) – only footpaths recorded on the definitive map of the county council will be regarded as public rights of way (PROW) with the legal safeguards that entails. Ramblers everywhere are attempting to get all country footpaths swiftly recorded to avert the possible loss of some of them. But what about the towns and cities ? Looking at a rights of way map of Chesterfield – and probably most other urban centres as well – it’s a patchwork quilt. Many of the ancient footpaths have been built over to provide the essentials of modern living – houses, roads, shops, places of work. This patchwork quilt is in some cases held together by footpaths and alleyways, some owned and maintained by the local council …. some not. What will happen in 2026 ? Perhaps not a lot immediately. Local councils are unlikely to suddenly close them all. But if paths do not have the protection of being an official public right of way their future must be less secure, particularly if they are on private land. 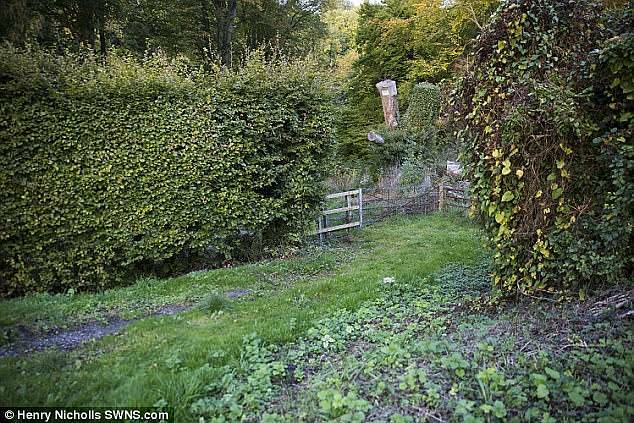 At the moment if a path can be shown to have been in regular use for 20 years or more it can be claimed as a right of way. Perhaps local councils should get together to put all these on the definitive map ? The map below is taken from rowmaps which is attempting to mirror the definitive maps of each county council. and risk losing parts of it ? Whatever individuals think of the merits of the high speed rail line HS2, organisations like ourselves have to respond on the assumption that the project goes ahead. The official response of Derbyshire County Council has been published and stresses the need to preserve the historical heritage of the proposed HS2 corridor and to maintain the continuity of routes, including footpaths, in the area. All comments on HS2, whether from organisations or individuals, must be sent by 31 January. An online form is on the HS2 website. …. been subject to mining and associated activities, which has also led to temporary or permanent closures and re-alignments of rights of way in recent times. …. We have concerns as to the completeness and accuracy of the information held…. HS2 Ltd must refer to the Highway Authority’s (Derbyshire County Council) ‘List of Streets’, and consult on all rights of way, including unclassified county roads, and about any pending Definitive Map Modification Orders. 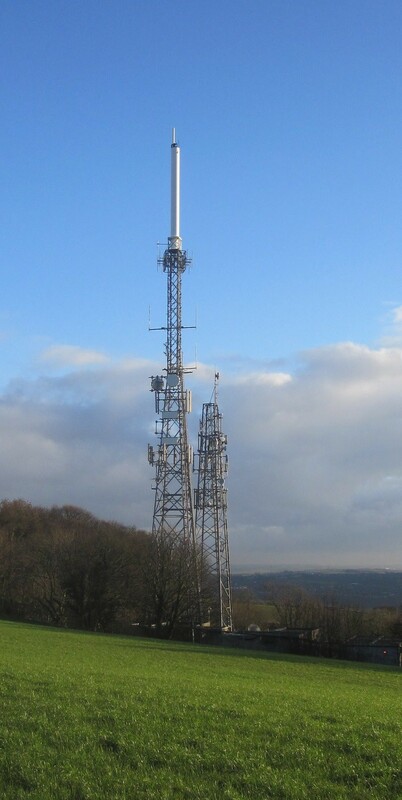 Reference must also be made to the Derbyshire County Council East Derbyshire Greenways Strategy which is council policy. This includes details of current and proposed Greenways…. The public already enjoy access to other non-statutory rights of way along trails such as the Trans Pennine Trail and other informal and permissive paths. Considerable amounts of time and money have also been expended in trying to re-connect Chesterfield Canal to the main canal network. Both of these will be seriously affected by the proposed route and sensible proposals for their protection must be made…. Whoever predicted a cold winter ? There is still time, but the weather, in between the waves of Atlantic depressions, has been mild and very often sunny. The big drawback for walkers has been ground conditions, probably as wet as most of us can remember. Many thanks to Kay, who led 19 of us from Coal Aston to Old Whittington (although some had seen enough mud by Unstone, where they caught a bus). 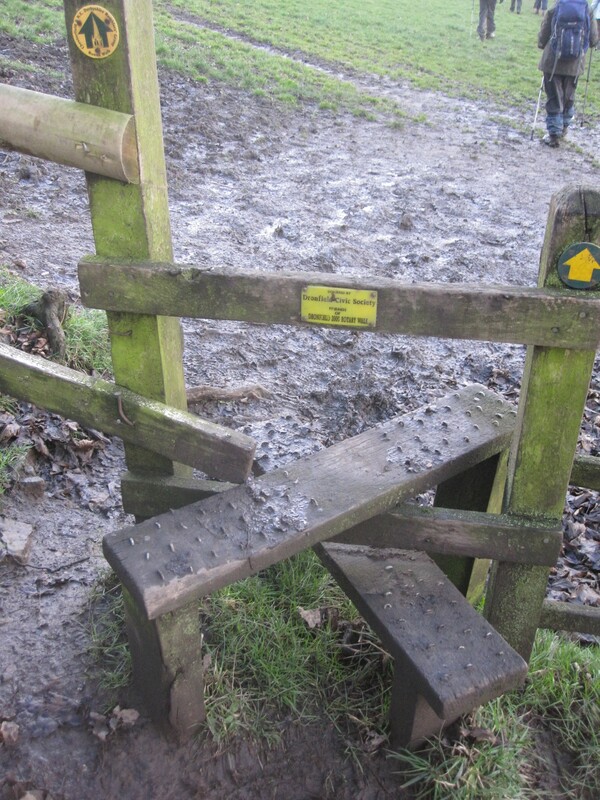 The conditions of the stiles are really important when it’s muddy. Surprising to some people, there are British Standards which can be observed. A complicated subject with which our footpath maintenance team will be more acquainted – but the guidance of Derbyshire County Council is a good start. Just as we in Derbyshire welcome walkers from all over, it’s great to know that as members of the Ramblers, we ourselves are welcome on other group walks throughout the country. These walks can really enhance a holiday and give the opportunity to meet other members of the Ramblers from the locality. Basil’s latest newsletter reports on walks by members of our group on the South West coastal path. Whether walking privately or with another group – on a cold January day it’s good to savour a photo taken in 90 degree weather in July, 2012. 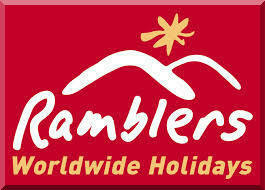 The Ramblers of course have been instrumental in the ongoing development of coastal paths throughout the UK. 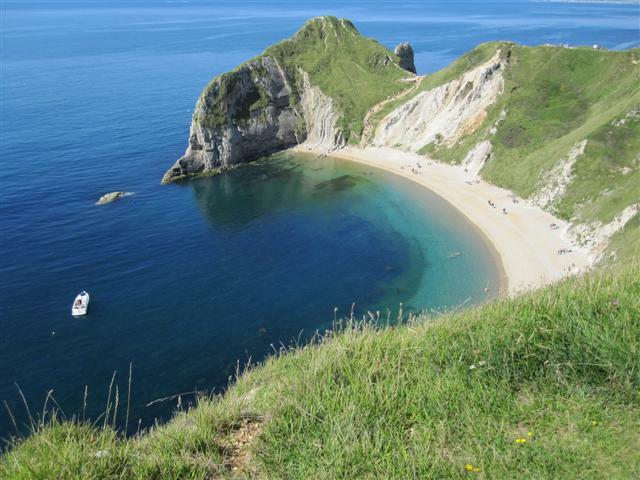 The Isle of Wight is currently struggling to be included in the programme and needs our support urgently. – but who else does ? 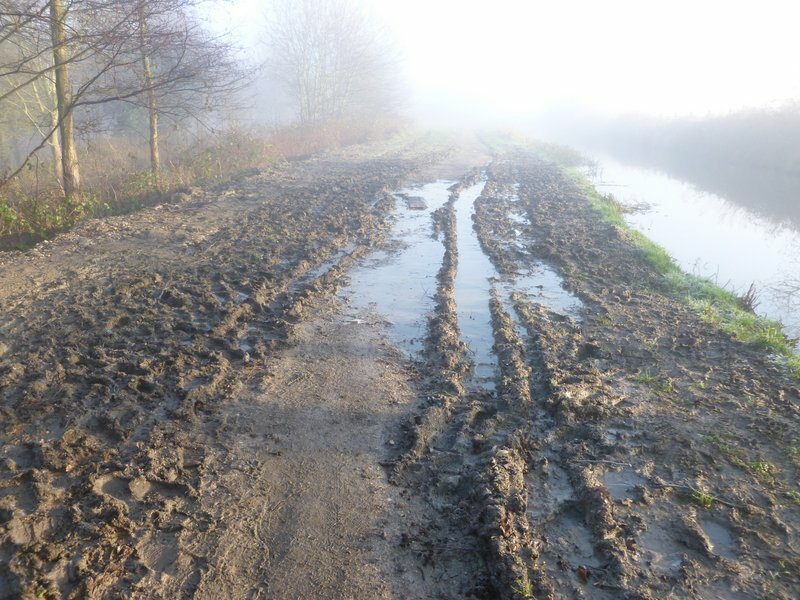 It’s hard to avoid wet conditions at the moment – and the South Chesterfield Way is no exception. 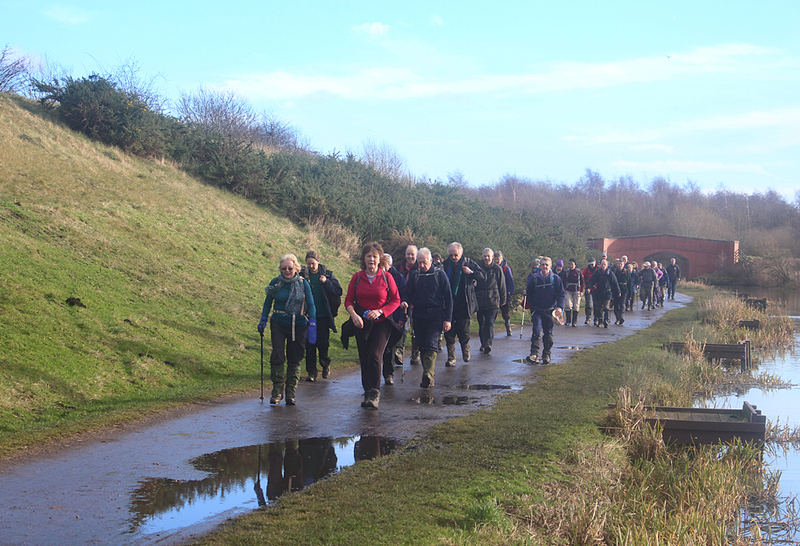 Basil led a good turnout of 22 from Walton to Clay Cross, mainly on the South Chesterfield footpaths. Relatively dry conditions in Britton Wood showed the ability of woodland at least to soak up the moisture. More tree planting and less deforestation must surely be one of the answers to our flood problems. Pat led the Saturday car group walk today from the Revolution House in Old Whittington, before the annual January meal. Six and a half miles, plenty of mud, sunshine and laughter. Thanks to Mel and Cathy for the photos. That man on a train, Michael Portillo. paid homage to George Stephenson in Chesterfield tonight – and visited Chatsworth. The iPlayer recording is available for most of January. A Wednesday car group get some winter sun, navigating the Chesterfield Canal. Continual heavy rain over the last month has made the going ‘heavy’ – to say the least. 16 of us took the bus to South Wingfield to follow a 10 mile route from there to North Wingfield. Tough going in places but welcome exercise after the usual Christmas lack of activity. There is no obvious link between the two Wingfields. They are a fair distance apart for places with the same name, and in different local administration areas. There is even disagreement on what ‘Wingfield’ means. Thanks to David for photos of a problem at Bluebank Lock on the Chesterfield Canal. If all the recent heavy rain is not bad enough the canal apparently has a bit of a leak. Derbyshire CC are working on it and the towpath will be resurfaced, though probably not before February.